The Port Museum at Founders Heritage Park gives an excellent overview of Nelson's maritime history, displaying models of a selection of the range of boats which frequented the region's coastlines and other relics of the past. Shipping was once Nelson's primary transport mode and key to the city's development. The exhibits also include part of the remarkable Captain Ricketts collection - more than 320 bottles,each containing as one or as many as 15 models of ships. The first room is the theatre  which shows a film covering the history of Port Nelson 1841-1980. It describes the making of the Cut through the Boulder Bank in 1906. This naturally protected harbour spurred the New Zealand Company in 1842 to select this as the site for the settlement of Nelson, but it later proved a barrier to the development of the Port for larger ships. In the early days ships entered the harbour around Haulashore Island, but by the 1890s changes in river flows had created Tahunanui Beach and contributed to the old entrance silting up. As ships became larger and trade increased, frustration was growing in January 1904 the Lutterworth was one of the last ships to run aground on the rocky approach to the harbour. Unless something was done, reported the newspaper, The Colonist, "Nelson faced not merely stagnation but ruin". Once the Cut was made, the film tells how the port has gone from strength to strength with the growth of the region. The model of the Awaroa  is a feature in the Museum's main display room. The Awaroa was a 71-foot, 59-ton topsail schooner built by David Gilbertson in 1875 for Captain James Cross of Nelson. It was named after the site it was built at, in Golden Bay, and was the largest vessel to be built there. Awaroa was one of the earliest sites in the region for shipbuilding and the surrounding land provided a significant resource of suitable timber, attracting several boat builders - amongst these were Ambrose Ricketts in 1855 ; and David Gilbertson from Scotland in 1865. 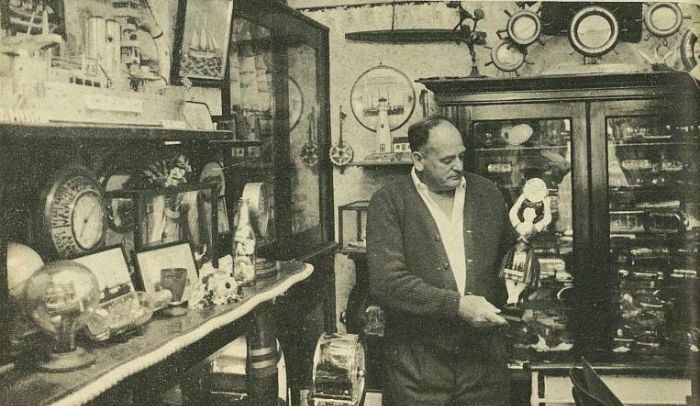 Another display cabinet contains relics from The Edwin Fox , including a section of the ships wheel. The Edwin Fox had a long and varied history, and is now preserved in Picton as a tourist attraction. A well used ablution cabinet or commode  is tucked into the corner junction of the glass cabinets. This comes from the Janie Seddon, one of two submarine mine laying vessels brought out from England in 1903. She was based in Wellington and her twin, the Lady Roberts was based in Auckland. She was used in port during both world wars and was an Examination Vessel during WWII. In 1936 Janie Seddon was purchased by Talleys Fisheries as their first trawler vessel, but she was too big for the job. In 2006 she had become a rusting hulk on the Motueka foreshore near Talleys headquarters. A splendid figurehead  sits above the cabinets. This was once on the bow of the ship ‘Messenger', which was wrecked off Farewell Spit in 1879. A figurehead embodied the spirit of a ship and was originally believed to placate the gods of the sea and ensure a safe voyage. Almost every sailing boat prow had a carved figure looking down at the waves, and the variety was immense. A cabinet nearby features a display of Blind Bay Hookers- Nelson's fleet of small sea-going craft of cutters or schooners, between one and 20 tons, which worked in the Tasman Bay area. Beyond this is a life sized "slab hut "  interior scene referencing Nelson's first European settlers. The raupo mat on the floor and kete are evidence of trade with the Maori, without whom the early settlers would have starved. An attractive seascape on the back wall features Arrow Rock and Harbour entry. The artist depicts a time before settlers carved the road along the rocks and made the cut in the Boulder bank creating Haulashore Island. Arrow Rock was later renamed Fifeshire Rock after the untimely wreck of the Fifeshire on 27 feb 1842. At the exit are some early drawings of John Waring Saxton. The Maritime Building holds a significant display of model ships in bottles from the Captain R J Ricketts family. The Ricketts family have a proud history linked to shipping in Nelson, starting with Ambrose Ricketts who was an early boat builder in Awaroa and, with other family members, ran a shipping firm for 40 years in competition with the Lady Barkly . For 35 years, the late Mr Russell Ricketts sent every available waking minute working on model ships to add to an ever-growing collection. The collection had about 2000 individual pieces and was passed on to his son, Captain Bill Ricketts, who cared for and added to what is a unique seafaring museum collection in New Zealand. There are more than 320 bottles on display here , each containing one rigged ship inside and some as many as three, and carboys, in which are assembled 15 fully rigged ships. One such carboy  is inside a large glass container originally used in the manufacture of alcohol. It contains a miniature replica of a view of Nelson Harbour in the 1880's created by John Turner on two levels. The circular structure sitting on the right on the upper level display was the old saltwater baths. The layout of the port has changed dramatically in recent years to cope with large container vessels and the log trade. On the voyage of the lord Auckland to Nelson, the ship had on board 171 passengers, 42 crew, 18 sheep, 18 pigs, numerous geese, ducks and chickens for food and 95 tons of fresh water. Above the model of the Fifeshire  are some sketches of life on board. Each family had a small curtained area where husband, wife and children slept together and dressed. The dining area was a communal space with a long table. The rations chart on display shows an unvaried, particularly nutritious, diet for the long voyage. It was unlikely much washing occurred either as there was a very small daily precious allocation of water. Another model of note created by Raggett is the Mataura  on your map. The Mataura was built in Glasgow in 1868 and purchased by the New Zealand Shipping Company in 1874. A fully rigged ship of 853 tons, she was fitted with the Harkin's patent dry air refrigerator and used to succesfully transport frozen meat to England in 1882. The meat from the young colony arrived at its destination in excellent condition to everyone's delight. The model of ‘Mavis'  was created by John Turner who died in 1931. It is a Steamer, whHi would have been familiar with Steamers like this in his youth, as they were used locally in the 1890s. The chart opposite  shows Tasman Bay with all the main ports, harbours and bays where ships would load and unload cargo. Displays of rare coral, nautical flags and knot crafts can be found elsewhere in the Museum. D.N. Frost's model of the Victory and a bust of Lord Nelson  provide a final reminder of how the city got its name. Want to find out more about the Port Museum at Founders Park ? View Further Sources here.